The number of student enrolment is higher than ever and, for the eleventh consecutive year, we have received a record-breaking number of applications from students who want to pursue a degree from a technical elite university with a global outlook. The international dimension is of vital importance to DTU. In 2014, we welcomed 538 international students into our MSc programmes, half of our PhD students are recruited from abroad, and more than one-third of our scientific staff are highly qualified researchers of international backgrounds. In addition, the extent and intensity of our collaborations with other leading technical universities around the world continue to grow. DTU offers MSc programmes taught in English for almost all research areas, thus offering students the widest possible choice. The structure and content of the various programmes reflect DTU’s status as one of the highest-ranking European technical universities. Through recommended study lines/focus areas, Joint International MSc programmes, Erasmus Mundus MSc programmes, and Honours programmes, DTU’s MSc programmes offer a broad range of curricula—from the highly specialized to a broader and more versatile educational profile. Feel free to contact either International Affairs or the professor responsible for the relevant MSc programme for further information. The MSc programme is a research-based technological programme at an elite level aimed at qualifying the graduate for a knowledge-intensive position in the industry and the business sector and in society in general. Graduates obtain the title Master of Science in Engineering in the given engineering field. 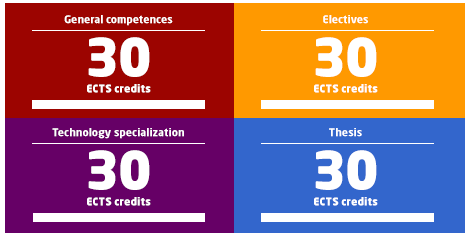 The MSc is a two-year programme with a workload of 120 ECTS credit points. DTU’s MSc programmes cover most modern engineering fields and are taught exclusively in English. The programmes comprise four categories of courses: General competencies, Technology specialization, Electives and Thesis. You learn how to define and provide solutions to an open problem. You may be part of a cross-disciplinary team and will be trained in communication and collaboration. This group of courses gives you the in-depth academic and technical knowledge necessary for obtaining state-of-the-art competencies within a specific field of engineering. By combining the technology specialization course with appropriate elective courses, you can create your own inspiring and highly individual study programme. An important aspect of the DTU MSc programmes is the significant number of elective courses. Here you can pursue your own scientific and professional interests. In principle, you can choose between more than 400 different DTU courses. The master's thesis marks the completion of the two-year MSc programme. The research project is most often carried out at DTU and in many cases in collaboration with one of our many industrial partners. All projects include elements of fundamental research, innovation and application. With an MSc in Aquatic Science and Technology, you can contribute to sustainable harvest and production of fish and shell-fish, assessment and management of human impact and environmental change as well as cutting-edge research on aquatic ecosystems, traits of their inhabitants, and their impact on global climate. The MSc programme in Physics and Nanotechnology focuses on physics as the basis of modern technology. The gap between scientific research and technological breakthroughs is narrowing. Therefore, in areas such as nanotechnology and sustainable energy, there is a growing need for engineers who can combine solid scientific knowledge with extensive engineering skills.